I was always an advocate for fashion and its cultural reach, but my viewpoint shifted once I took Fashion History and Global Attire here at LIM College.During our first class, my professor proclaimed: “Fashion has come to a grinding halt. Nothing has changed since the 1990’s…so what’s the holdup?” Her question was meant to inspire conversation, and the more we explored this topic, I realized that fashion has become repetitive. We’ve seen collections spanning several seasons constantly referring back to and reviving past trends and silhouettes. Are designers recycling old ideas and polishing them up in a modern way because that’s the direction fashion is truly taking, or is it a reaction to an even bigger influence? I asked one of my peers from that classroom about her opinion of this one particular class. “I didn’t realize how true her statement was until she asked us what we were wearing,” says Wioletta, the first of my interviewees. She’s referring to when our teacher asked us students to take a look at our pants, and we realized that nearly everyone in the classroom was wearing tight or skinny trousers, a true fashion staple since the 1990’s. Wioletta went on to say that “fashion hasn’t picked a silhouette that’s different from the ‘90s because it’s a safer bet…which isn’t exactly a horrible thing.” She says this in a begrudging way, as if she also wishes fashion would get on with it. But what actually qualifies as a silhouette? What determines if a piece of clothing can be considered part of a blueprint of what society is currently wearing? Usually, an era’s silhouette matches up with the body ideal of that decade/era. 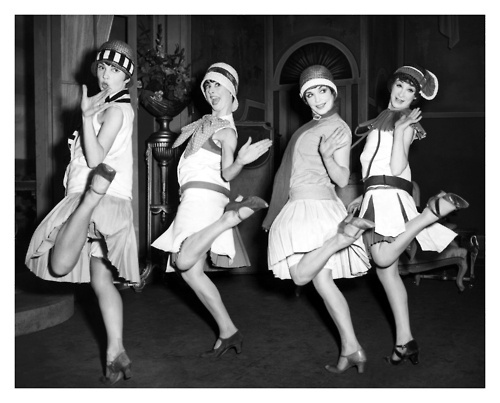 For example, the female body ideal during the 1920’s was boxy and stout, which is reflected in their penchant for drop-waist skirts and boyish haircuts. I asked two college students, Anna and Sara, both of whom aren’t interested in fashion, what their thoughts are on today’s body ideal. I took what Anna and Sara said to heart, and I realized that today’s body ideal cannot be pinpointed as one body type. Women like Kim Kardashian and Jennifer Lopez, both of whom have very voluptuous figures, are considered to be some of the most beautiful women in the world,and yet thinner, slighter women are also considered to be part of our body ideal, as evidenced by who is walking down runways at fashion week. In relation to today’s silhouette, clothing fits close to the body, with nothing protruding out from the outfit, unlike the “bigger is better” trend of the 1980’s. It’s no wonder fashion can’t pick a 21st century silhouette, there is no single body type to strive for. To reach back to Wioletta’s point about safety, another answer to this question can be found in the industrial age of the 19th century. During the heyday of Industrialization, society and technology were moving at a breakneck pace, and due to a rapidly changing world and its values, fashion began to make safer choices when it came to clothing. As a result, the silhouette of this era reverted back to old and constricting trends in response to such rapid change. The situation is similar today. Advances in technology over the last twenty years have completely changed the landscape in which we live our lives, and fashion has reacted to these changes. We now have access to trends of different eras through the internet, and inspiration is everywhere. I believe fashion’s next frontier is wearable technology, and once the fashion industry leans into the technology boom, we will finally begin to move in a new and innovative direction. However, none of this spells out doom for fashion and its worshippers. The world is once again moving at a breakneck speed, and turning to past trends and relying on a familiar silhouette is a way for society to get used to the idea of rapid change and to adjust to a new life pace. This simply means that innovation is right around the corner, and every runway showcasing a new collection brings us closer to the modern-day version of Christian Dior’s New Look revolution. I will certainly continue to be an advocator for fashion and its influence, but my viewpoint has shifted to encompass the past, present, and future.